It’s the first Mag Review of 2019. I hope you enjoy these. I certainly have fun doing them. By the way, I’m going to start something new. While I love these magazines, I don’t want to keep them all forever. So I will start giving them away at certain panels at various conventions. I’ll ask a trivia question and the winner gets it. I’ll also give out hints in my weekly update the week before those events. Stay tuned for ChattaCon. Anyway, I’m reviewing Astounding Science Fiction, Vol. XLVII, No. 1 (March, 1951) today. Whatever else this issue contains, I love this cover. Rockets, stars, emotion. I love it. Live – in a million could-be years, on a thousand may-be worlds. The hope and attainments – the strivings and ultimate defeats – of all the future years of endless time. We’ve a Time Machine for sale – a simple little machine of paper and ink that, coupled with your own mind, can soar down the years of Eternity. It’s a small thing – and the doorway to Infinity and Eternity . Ok, you got me. Sign me up now! The issue starts with John W. Campbell’s editorial Elementary, My Dear Watson. This discusses how man is beginning to use a variety of elements that had been difficult to use up to that point, including rare earth elements. It was cool, but I’d it’d be especially interesting to someone who actually deals with such things to get a perspective from 67 years ago. 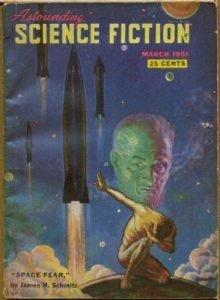 Next is the first story of the issue, Space Fear by James H. Schmitz. This was a puzzling story to me. It had so many elements that I like, but it seemed disjointed and I never really got into the flow. It’s about an agent of the Confederacy of Vega who pilots an intelligent ship fixing problems in the galaxy. That’s a fantastic start, right? Well, the problem is that the story sends her on a number of missions all at once. The first thing is a mission to try and trap an alien race that sends ships in that are so far advanced they come into their space, look around, and then leave without hindrance. Trapping them would have been a great story. Instead, that’s sort of the prologue. While she makes progress, more progress than anyone had before, they send her on another mission. With it’s own set of exposition. Then another. It’s so jumbled I’ll freely admit I couldn’t really read the story well. I kept getting jarred out of it and skimming a bit until something caught my eye. I tried four times to thoroughly read it, and it’s clearly beyond me. I’ve liked Schmitz before, but this story kept dancing around at the edge of my attention, always seeming to push me away at some point. A full space opera novelette wasted. That is, in these magazines, a true tragedy. Cut it into separate fast-paced stories and you got a tiddly little book along the lines of the Retief adventures or the novel M*A*S*H.
Next we move on to Philosophical Corps by E. B. Cole. This was Cole’s first release, and he didn’t write much more besides it. It’s too bad, because I think he had a goodly amount of talent. A side note. This story starts off poorly in the magazine. There’s a longish excerpt from a future book that’s pure exposition. It has two problems. One it’s longer than perhaps works for a short story. Two, and far more important, the excerpt was printed in the magazine in a smaller font. Like difficult to read smaller font. But if you get past that you get another story that has so much potential. The Philosophical Corps are the people who go to planets where the inhabitants are low tech and have had criminals and slavers set themselves up as gods to steal their wealth and gain slaves. Not only do they have to rescue the indigenous population from the criminals, they have to do so on a way to keep the planet growing as it has without too much corrupting of its way of life. Man, this could be an awesome series of stories. Tap-dancing through the challenge of understanding a myriad of alien civilizations while facing high-tech organized crime? If you ever see me write a book entitled E.B. Cole, PCI you’ll know it’s about a hard-boiled detective going from planet to planet fighting interstellar crime bosses trying to be gods. Of course, you might say Stargate already did that. You’d be right. Doesn’t mean I couldn’t do it, too. I will also say that had Cole written more of these, he would have written stronger stories. This one is good, but somewhat direct. He released a later version of this story along with two other adventures in that universe in 1962, and I expect those are all stronger. Still, this is a B/B+ story with tons of untapped potential in the universe. Next we come to a skillfully written story, …Of the People… by Morton Klass. Klass was an anthropologist, and not surprisingly this story deals with the study of a people. Like E.B. Cole, he didn’t write much and again, it’s a shame. This story starts out in a strange way, taking us to a place I didn’t care for initially. Basically, it’s about the President of Earth in 1975 talking about how he earned that title starting in 1955. He’s actually an alien who, with his advanced technological and cultural was able to unify the Earth. He was actually sent here by his race because the Galactic Federation did not know what to do with this planet. We had achieved atomic power, but had not settled down. So they put us in quarantine for a while so that they could take a look at us later before possibly exterminating us. The species that the President comes from could not let that happen without trying to help, so they sent him. Understand that this is tripping all of my buttons, and not in a good way. I may be an idiot, but I’d rather fail trying stupid stuff than having someone swoop in and protect me from making the attempt. Let me touch the hot stove and find out it freaking hurts, if you please. But Klass is tricky and I ended up really liking this story. You see, the President has discovered that the entire council that helps him rule the earth consists of aliens sent by worlds who have just as much empathy as his. They’re all here to help. However, the quarantine is about to end. The Federation is likely to send them all away. Not only will they rip away this world government, but they will expose that it’s composed entirely of aliens. Yes, the flying saucers did come to control us. The President knows he can’t allow this to happen, so he confronts the council. No matter where they came from before, he and the councilors are now from Earth. Now they have to defend it from the Federation. That’s where the story ends, so we don’t know if they succeeded or not, which is fine. A full answer would take a novel, in my mind, and I think this is stronger by Klass letting the reader think he’s going one way and then pushing into what is clearly an oncoming train full of adventure and politics. His technique is amazing. I don’t know that I’ve ever had a story I disliked so much at the start come right around and use my distaste like that. Here, let’s challenge your independence, then let’s make it something we can root for. Brilliant. Next we get to Casting Office by Henderson Starke (really Kris Neville). This story has an interesting premise. Basically it’s discussing the plight of actors seeking a job, along with stagehands, directors, and the like. It becomes clear that the author is God, who has made a universe of strange physical laws and outlandish events. He wants a place to exercise his whimsy and also to retreat to so he can become happy, but he also has this idea that the story will eventually be that of overcoming great trials. Unfortunately, ratings plummet essentially. Critics lambaste his work. Eventually the directors bring in a script doctor over the author’s vehement objections. They turn his tale of heroism over the millennia into a horror movie that panders to those viewers who want violence. Fascinating premise indeed, but not well executed. It needed more detail and less top-down discussion, I think. For example, the story talks about the critics blasting it, but never has a paragraph that talks about specific issues. It leaves the story too vague and we’re not invested in it. There’s a solid scene where the author is in a role as a wealthy man enjoying good food, driving on beautiful days, the company of lovely women, and fine drink. Then he’s ripped from it by the director in order to face the music from the critics. That was great. It’s the only such scene, really. Oh, there are hints here and there of odd props like millions of extra bugs for England in 1869, but there’s just not enough of this quirkiness. After that comes Experimentum Crucis by Andrew MacDuff (E.B. Fyfe). This is a solid story with a fun twist at the end. In it we have a human visiting an alien planet that is at something like our technological level of the 1970s. The human is there negotiating a variety of mineral and resource rights on the moons of the system. The leader of the aliens is not stupid, though, and he is wary of the negotiations. His suspicions are increased when the human finds out about a particular moon with high radiation readings and has his car salesmen tendency come to the forefront. Basically, the alien sets it up that if the human lands on the moon, he’ll come out ahead by owning the sponsorship rights. And, if the aliens’ belief that it’s a moon made of negative matter, “there will be a beautiful flare-up to prove my claim” (p. 97). Gotta love the bad guy getting his comeuppance. Following is the normal In Times to Come description of what’s in the next issue. Included is one of H. Beam Piper’s Paratime stories, so I’ll look forward to unearthing that issue eventually. Then we get High Threshold by Alan Nourse. I’ve reviewed Nourse before and I will look forward to seeing him again. He writes good stories, though not yet a great story. This one starts out very well. While experimenting with temperatures around a thousandth of a Kelvin, researchers discover an entrance to a completely alien place. The five people that have been sent into the entrance have all died of fear. The only hint they have is a tennis ball, which went into the entrance and came out completely reversed. The fuzzy part was on the inside and the rubber on the out. The same thing happened to a pencil, which returned as a sliver of wood sheathed by graphite. The answer they come up with is to find someone so completely able to reject earlier data and accept new data, so adaptable, that they can survive long enough for their mind to adapt. They find someone and send her in there. She goes in and realizes what’s going on, but realizes that she cannot explain the differences to the researchers because they simply have no way to understand. Her solution is to find a newborn baby and raise it in both worlds so that it can relate both universes instinctively. This is all good stuff. The end isn’t as strong, though. She also realizes that she is going to have to trick the researchers into letting her try the baby idea. She also knows that she can now see how to get into that universe at any time. She plays as if she’s insane, and then escapes through the dimensions. I sort of felt unsatisfied, almost as if I’d ordered chicken fried steak and there was no actual steak inside the breading. The breading, gravy, and mashed potatoes all tasted good, but it was missing the substance. Maybe the story should have been longer. Maybe a completely different twist that I’m not thinking of. I don’t know. Still, it should be noted I was sucked in reading this story and it is only at the end that I realized I wasn’t satisfied. Next, in a half-page blank area, Campbell talks about what he looks for in the letters that he’ll respond to in the Brass Tacks section. He’s looking for things that are broad and general and will have some connection to the majority who read Astounding. One wonders how many times he was nagged for not putting up a convention announcement for Wecanhandle50peopletotalacon or letters announcing someone has a cool pet rock for sale. The next story is Protected Species by E.B. Fyfe writing under his own name this time. This is an oft-published story, meaning a bunch of readers liked it. I’m one of them. It’s about surveyors and xenoarchaeologists on a nearby planet studying ruins of a long-dead alien civilization. The ruins show advanced technology, but also damage from explosions and war instead of earthquakes and natural disasters. There is no evidence that the people who made those ruins exist anymore, except perhaps a species that might have devolved from intelligence in the wake of wars. The species provides some of the workers with a bit sport. They’re fast and hard to catch, and there’s not much else to do on the planet and their morale is generally fairly low. Then an inspector comes to look at their progress. He sees these hunts and he is bothered by them, especially with the likelihood that they are intelligent, even if devolved. So he arranges to have them named a protected species, preventing future hunts. After so doing, he takes one last pass around the ruins, going specifically to a place where he had run into one of the natives, which had prompted his work to name them protected. There, another native awaits him. Instead of running, or throwing rocks, or anything likes that, he greets the inspector by name. Apparently they have been watching this world for some time. His job is to watch for the revival of the original species on this world, and he is quite pleased to see the inspector name the species on this world protected. For, after all, that is what they actually did for humans after destroying this world humans inhabited. He’s very happy to see us finally returning to the stars. Perhaps, soon, we won’t be a protected species ourselves. Fun twist, and an excellent job of twisting our humanocentric point of view against us. That’s two stories by Fyfe in this issue, and both are good to very good with good twists. I’ll keep an eye out for him. Next is an article Notes on Nuclear Radiation by Edwin N. Kaufman. He didn’t write much for any SF magazine. He appears to have been an aeronautical researcher for Douglas and Lockheed, but I can find little more about him. Anyway, like Campbell’s editorial to open this issue, I found this article moderately interesting, but obviously outdated. Again, i think this might be fascinating to someone in that field and interested in its history. Jack Williamson is next with The Man from Outside. Williamson is one of the great fathers of SF of course, and I him a lot. I would expect a sizable fraction of you readers know he’s the guy who coined “Terraforming” but I had not realized until reading up on him today. Anyway, this story is about an alien unit dedicated to watch Earth and ensure that its society is not corrupted by other aliens. The commander of the unit is hard, harsh man. A fresh idealistic lieutenant comes to him and asks to involve himself in the world below. The commander refuses. The lieutenant persists, finally convincing the commander something must be done, but the commander stalls and delays. Then, before the mission is done, he brings the lieutenant back. The lieutenant is anguished. He wants to help some dissidents kill Stalin, who he realizes only exists because of outside contamination and who is an abomination. The commander stops him, and the dissidents are destroyed because they make a mistake designing a fusion bomb. In the ensuing exchange, we discover that the outside influence that allowed Stalin to exist is the commander in his youth, as an idealistic lieutenant. He met Lenin, was impressed, and let slip some advanced knowledge about revolutions and the like, allowing for the Soviet Union and now Stalin. Where should duty and idealism meet? What’s the balance. It’s a tough question because unintended consequences are always lying in wait. Great story. Next is P. Schuyler Miller’s book reviews of the month. Among this set are books by Heinlein, Merril, Lieber, and more. Imagine getting paid to read those guys. Last is Brass Tacks, the letters to the editor. There’s a lot of discussion about previous letters in this issue. Sort of like a monthly opportunity to reply on Twitter. The only difference is that the responses here are well-written with thought behind their premise. The one topic I think remains relevant is the discussion of what language should an author use in SF/F. It’s a tough one sometimes, and I try to strike a balance. Language in another world would be completely different with different foundations. We would all have to be linguists to understand them. Obviously, this is what Tolkien did. Yet he knew he could not write a tale in Elvish. He was also aware that the common speech was not English. He put enough of the other language in to give the flavor of Sindarin or Quenya or whatever. I think that is what we must do to give the taste of an alien or fantasy world. But there’s a balance, and I’m not sure I’ve achieved it. I will occasionally perform Old English poetry, usually the Wanderer or Beowulf. Mostly, I do this in modern English, but I regularly insert a few lines here and there of Old English to let the sound resonate. It’s a tough thing to accurately re-create a medieval performer. On the one hand, they had to connect with the audience so they could make money or have a place to sleep and eat. On the other, a true performance should be in the original language, but little else sends an audience away than reciting poetry in a language they don’t understand. Might be better to recite Vogon poetry. Flipping languages back and forth is my best compromise. I don’t know if I have the answers, but it’s something I dwell on probably too often. If the language takes me out of the moment, then I know it’ll take some readers out, too. My problem is that I also know I use words that flow with me, but not with others. It’s a challenge, and no doubting. Anyway, overall this was a grade B issue. All the stories were quality, even if I didn’t like the execution or some other quibble. There weren’t instant classics to me, but still I’ll reread a few of these someday. Next week I’ll review the Analog from February, 1963. This one looks promising with a Gordon Dickson and H. Beam Piper. I’m way behind in doing interviews. Blame it on #FourHorsetober and the dozens I did during the month. But it’s time to get back on the horse. This week, R.J. Ladon is joining me. She, too, is part of the 4HU, but I couldn’t squeeze her interview in during the month. My apologies to her for the delay. To cut down the mightiest tree in the forest with a herring! When I was young (8-9ish) Gary Gygax purchased our family Arabian horse ranch. He gave my siblings and I, “Dungeons and Dragons” books and modules. He even played a short game with us noobs so we could understand what D&D was all about. I learned from him that some of the most interesting and entertaining stories, creatures, and environments come from your mind. Years later, I learned who that Gygax fellow was, and how important he was to my journey, er quest. Yellow, no blue. You know the adage “write what you know”? Well, I had to sacrifice many children to my Nerf Guns to make the “foam dart scene” come to life. I try to learn the “how” of the things I write about. The hands-on experiences of the SCA and Rendezvous groups have been excellent. Write what you know–if you don’t know–go learn, go experience. (Rob’s Note: I really appreciate how my SCA experience helps me add touches to my writing, especially with medieval materials and food). What is the average flying speed of an unladen paint brush? Would that paint brush be male or female? Where do I start. My biggest challenge was, and to some extent still is–finding time. The only way for me to get over this copout was to schedule time into my busy day. In effect treat writing like a job–you have to do this or you won’t get paid. What are the powers of your personal Holy Hand Grenade? I’ve been told my scenes are easy to read and understand. Like watching a movie inside my brain. Not sure that is a success or not but it makes me happy. Favorite Sports Team? I don’t have time for sports. Favorite Musical Performer We’ve Never Heard Of? https://www.tartanic.net/ Drums, Bagpipes and Belly Dancers – what else do you need? Steak Temperature? How about some chicken? Winter, Spring, Summer, or Fall? Yes please. All seasons have their merits. Favorite Pet? Too many to choose from–someone would get jealous. Best Game Ever? Blood of Heroes!!!! (Rob’s Note: Somewhere, my friend Pavel is smiling at this response. Then he’s punching an angel and saying, “The level of violence in this heaven is too low). Sci-Fi or Fantasy? Wait…is there a difference? What question(s) would you like to ask me? I understand you are a wealth of knowledge of the Myth and Culture of Renaissance and Medieval time periods. Where did you learn this information? School? Books? Other? Please explain. Rob’s Answer: Yes to all of it. I loved Bullfinch’s Mythology as a kid and prowled through every Arthur thing I could find. At around 10 I read Tolkien, then stumbled on Susan Cooper’s The Tide Is Rising series. Somewhere along the way I realized that reading Beowulf and epic poetry out loud was magical and amazing. So when I had the choice of what to study in grad school, I chose Anglo-Saxon England. Not only was wallowing in Beowulf, the Wanderer, Anglo-Saxon riddles, and all the rest fun, but there’s good solid historical evidence hidden in them. That meant reading more and more myth and legend to find small nuggets of cultural gold. I still do that. And yes, that helps me build worlds, both because it gives me extra tools and because it’s so much fun. Shijuren is a deep, rich world that I’ve barely started to show to all my readers. Coming soon: The first book in the Bloodstone series, to be available in 2019. My short “The Felix” can be found in “Tales from the Lyon’s Den: Stories from the Four Horsemen Universe. Liberty Con 2019– May 31st to June 2nd at the Read House in Chattanooga Tennessee. Do you have a creator biography? My name is RJ Ladon. I’m a Design Engineer by trade. I’m also an author. I have contributed one Military Science Fiction story to the best-selling Science Fiction Anthology ‘Tales from the Lyons Den: Stories from the Four Horsemen Universe’, and two horror stories to ‘Sha’Daa Toys’. Currently, I’m writing ‘Bloodstone’ a Young Adult Urban Fantasy novel. ‘Bloodstone’ will be the first in a series, and released in early 2019. I’m a native of Wisconsin, where I still live today, with my husband, daughter, two adult sons, and a menagerie of animals. I also maintain a vast garden, and a fruit and nut orchard. Thanks to RJ for taking the time to answer my questions. If you have any suggestions or comments about this interview format, let me know so I can keep tweaking it. Also, thanks to you for reading. If you’re interested in any of the other interviews I’ve done, you can find them all here: http://robhowell.org/blog/?cat=326. If you are a creator, especially an independent creator, and you want to be spotlighted in a future interview, email me at rob@robhowell.org. Finally, if you want to join my mailing list, where I’ll announce every interview, as well as what’s going on in my life, go to www.robhowell.org and fill out the form (Name and Email Address) or drop me an email and I’ll add you.